FACT CHECK: Spin Aside, Donald Trump's National Security Council Has A Very Big Change The White House argues little has changed when it comes to its National Security Council. But the elevation of chief strategist Steve Bannon to the Principals Committee represents a major departure. 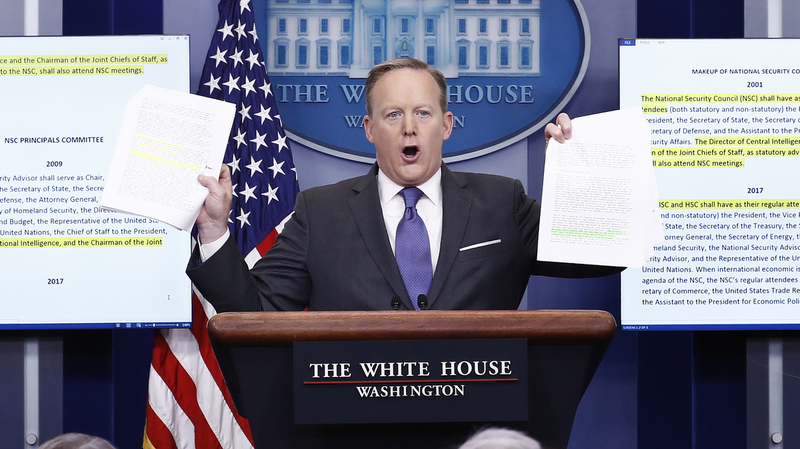 Trying to prove a point that little has changed, White House press secretary Sean Spicer holds up highlighted papers about the National Security Council. But that's not quite true. Holding up papers with highlighted text, White House press secretary Sean Spicer said little has changed as it relates to the National Security Council between the Trump, Obama and Bush administrations. He thundered of "identical language" between (parts of the) 2017 and 2009 memos organizing the NSC. And he went further when it came to George W. Bush's administration. "The makeup of the Principals Committee from 2017 is exactly as it was in both 2017 as it was in 2001," Spicer boasted, brandishing the texts in both hands. "100 percent identical, except we add the word also." President Trump and this White House have come under scrutiny and criticism in some corners in recent days for elevating chief strategist Steve Bannon to the Principals Committee of the NSC and demoting the director of national intelligence as well as the chairman of the Joint Chiefs of Staff. "The PC shall have as its regular attendees the Secretary of State, the Secretary of the Treasury, the Secretary of Defense, the Attorney General, the Secretary of Homeland Security, the Assistant to the President and Chief of Staff, the Assistant to the President and Chief Strategist, the National Security Advisor, and the Homeland Security Advisor. The Director of National Intelligence and the Chairman of the Joint Chiefs of Staff shall attend where issues pertaining to their responsibilities and expertise are to be discussed. The Counsel to the President, the Deputy Counsel to the President for National Security Affairs, and the Director of the Office of Management and Budget may attend all PC meetings. ..."
"The NSC Principals Committee (NSC/PC) will continue to be the senior interagency forum for consideration of policy issues affecting national security, as it has been since 1989. The National Security Advisor shall serve as Chair, and its regular members will be the Secretary of State, the Secretary of the Treasury, the Secretary of Defense, the Attorney General, the Secretary of Energy, the Secretary of Homeland Security, the Director of the Office of Management and Budget, the Representative of the United States of America to the United Nations, the Chief of Staff to the President, the Director of National Intelligence, and the Chairman of the Joint Chiefs of Staff. The Assistant to the President and Deputy National Security Advisor, the Deputy Secretary of State, the Counsel to the President, and the Assistant to the Vice President for National Security Affairs shall be invited to attend every meeting of the NSC/PC. ..."
"The NSC Principals Committee (NSC/PC) will continue to be the senior interagency forum for consideration of policy issues affecting national security, as it has since 1989. The NSC/PC shall have as its regular attendees the Secretary of State, the Secretary of the Treasury, the Secretary of Defense, the Chief of Staff to the President, and the Assistant to the President for National Security Affairs (who shall serve as chair). The Director of Central Intelligence and the Chairman of the Joint Chiefs of Staff shall attend where issues pertaining to their responsibilities and expertise are to be discussed." Bush's initial organizational order forming the NSC (above) designates that the CIA director and the chairman of the Joint Chiefs of Staff would attend on an as-needed basis. But that was before Sept. 11. "In effect, after 9/11 the practice was they were in almost every meeting," David Rothkopf, CEO and editor of the FP group, which publishes Foreign Policy magazine, told NPR's Scott Horsley. "The structure changed again in the Obama administration. And the big difference between this NSC and past NSCs [is] not really with regard to that particular issue." The bigger issue is Bannon. Having the president's chief strategist designated to be on the Principals Committee is a departure from any past administration. Yes, Obama adviser David Axelrod regularly attended NSC meetings, as Spicer has said. But Axelrod noted he never sat in on a Principals Committee meeting. He tweeted: "I sat on sidelines as observer on some issues 2 gain an understanding of decisions. Bannon's new ground." "As a senior adviser to President Obama in 2009, I had the opportunity to witness the fateful deliberations of his National Security Council Principals committee over the strategy the U.S would pursue in the war with Al Qaeda in Afghanistan and Pakistan. I was not a member of the committee. I did not speak or participate. I sat on the sidelines as a silent observer with [former White House press secretary Robert] Gibbs because we would be called upon to publicly discuss the president's decision on that critical matter and the process by which he arrived at it. "In elevating Bannon to sit with the Secretaries of Defense and State and other key national security figures on the NSC principals committee, President Trump has blazed new ground. Bannon will exercise authority no political adviser has had before. He will be a full participant, not an observer, in national security deliberations. "Ten days in, this much is clear: Steve Bannon is playing a role in national security and foreign policy for which there is no precedent. And for better or worse, he already is making an impact." Rothkopf notes that Bannon, the former head of right-wing nationalistic website Breitbart, "has been given a very substantial national-security portfolio despite very little experience in that area and a permanency on the NSC. "And I think if you give somebody with no experience and a political agenda, and a dubious one at that, a permanency, it casts the on-demand participation of the chairman of joint chiefs and director of national intelligence in a very different light, because it's saying, 'We are not prioritizing professional expertise; we're prioritizing political agenda.' "
NPR's Maya Fitzpatrick contributed to this post.